Just call it the Hitler of the Year Award and get it over with. 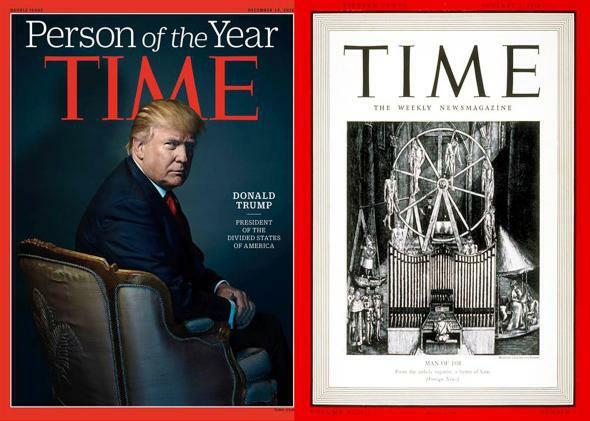 The 2016 (Trump) and 1938 (Hitler) Person/Man of the Year covers. Photo illustration by Slate. Images via Time magazine. Step 1. Time selects Donald Trump—or Vladimir Putin, or Yuri Andropov, or Ayatollah Khomeini, or whoever—as its Person of the Year. Step 2. Some readers react with disbelief that Time would honor such a distasteful individual. Step 3. Time explains that the selection is not meant to be an honor, but merely a recognition of “the person or persons who most affected the news and our lives, for good or ill, and embodied what was important about the year, for better or for worse.” The magazine then notes that both Hitler and Stalin were recognized as Men of the Year early in Time’s history. Step 4. A few years go by in which Time selects more admirable (or at least less controversial) POYs such as Angela Merkel and Pope Francis. Step 5. An unpopular person dominates the year’s news and we go back to Step 1.